Im looking for a bit of advice on reasealing my flue pipe. Its leaking a fair bit and the water is making my stove look very shabby and contributing to rust. Ive got the right sealant, ive got the red oxy paint. Ive seen a youtube video and waiting for a dry day to get this done. But ive gone to look further to check the two bolts and it appears they are circular. Will attach photo. So im wondering if anyone has come accross these type of bolts before and know what tool will get them open. Also what is the best tool i can get for taking the paint back to bare metal. Some tips would be good. the "round head" bolts are "cup square" usually - under the round head is a square section which locks into a square hole in the collar. Attract the outside with scrapers and a wire brush. Clean the whole area and ensure it's all dry. You'll need to invest in heat resistant mastic type stuff. Fill the gaps with this stuff, then as I have just done, get some metal filler from a place like Halfords, and fill and make it as smooth as a baby's bot bot. Paint and live happily ever after. Get some stove black paint a tiddly the stove. It don't 'arf make you happy. I've written the above hoping you have ability to purchase the goods. Location etc. 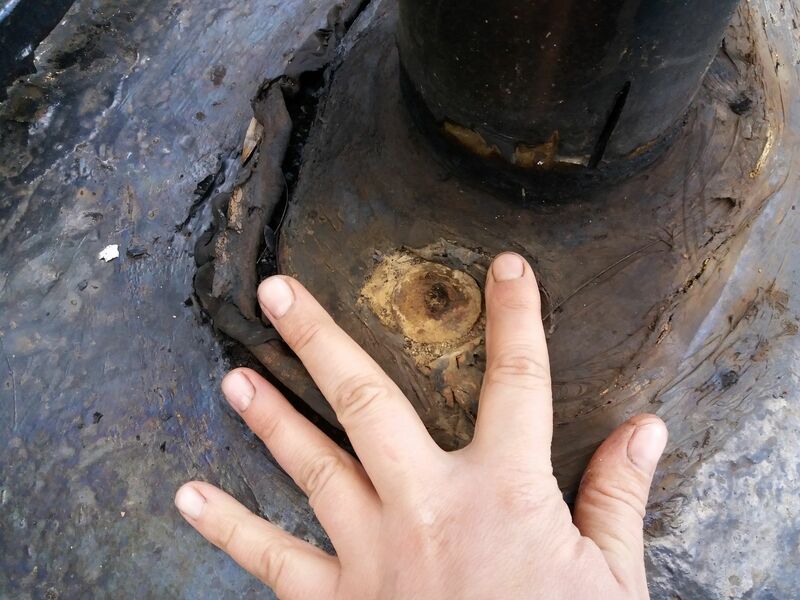 Like Ditch said, they are coach bolts so the nut is on the inside, probably behind the lining, you will have to get access to this somehow, this might require drilling a neat hole with a hole saw to get a socket in. If you can take the flue right out you might just get in with a spanner. If you are unlucky it might all be very tight/rusted solid and/or the coach bolt might spin, drilling or grinding out the bolt head will then be required. A wire cup brush in an angle grinder should take the paint off but is a bit brutal but ok on an older (non shiny) boat. A hand wire brush and sandpaper will also do it with Lots of hard work. A grinding stone in a Dremmel is good if you have any pits, though a bit slow. That ring is probably a cosmetic finisher to go over the flue where it goes through the roof lining. 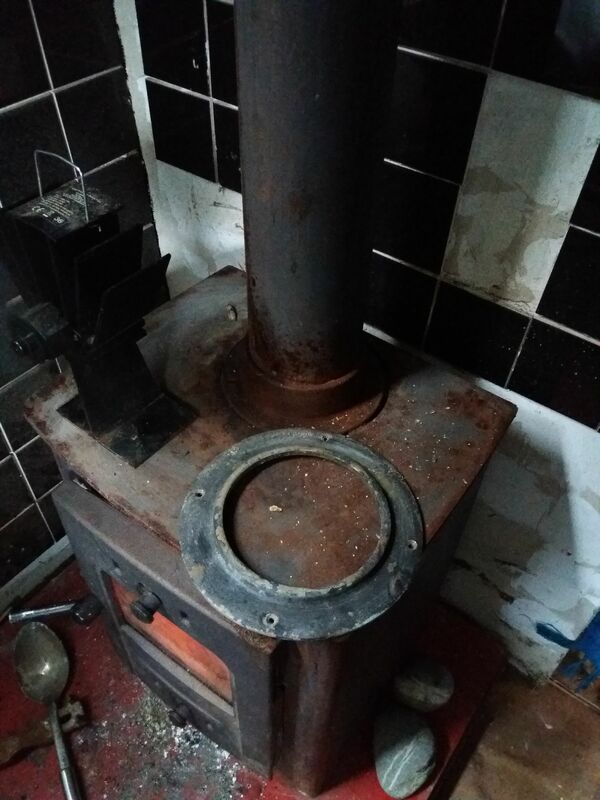 Its all hard work but the stove is a critical part of the boat, and a safety issue if done badly, so its worth sorting it out properly. Could be worse though, we've got two of these things! I removed and resealed our collar last year. It is a job best left to the spring if at all possible,and is safe to do so, as there is a fair amount of time involved to do it properly. if you don't live on the boat, or have a separate heat source,its probably not too bad. Anyway, first off, are you certain that it is a leaking deck collar. It looks pretty likely, as it looks to be in a poor state. 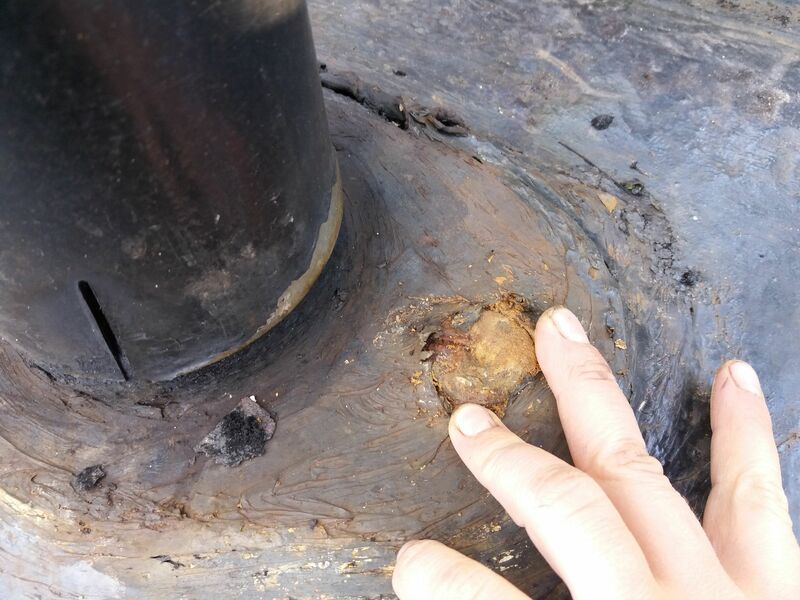 The other place to check for leaks is at the top of the flue pipe inside the deck collar, a common place for leaks. If you are certain it is the deck collar, then it is best to remove and reseal it with new coach bolts. Needle guns are dead good tools but its not something that you find in most toolboxes. Hiring a needle gun and associated fairly large compressor just for a chimney collar is probably not really worth it, but if you had several other jobs to do at the same time then it would be good. Buy ear defenders for yourself and neighbours. Allen has nothing to do with them, couch potato bolts. A fun job, best done in good weather. Hope that the flue pipe has not rusted away at the top. I tend to agree, blowing the pic up does reveal what appears to be a hex socket. They look like coach bolts to me. If the holes in the chimney collar are square, then you may be able to undo the bolts if you can get to the nuts below. But if the holes are round the bolt will just rotate, and you wil lhave to use an angle grinder to remove the head, and then push the shank through. You will still need access inside the headlining to tighten the replacement bolts. That spare ring looks more like a porthole surround to me, and probably nothing to do with the stove. But it could perhaps have been intended as a trim around the flue pipe where it passes through the cabin ceiling lining. But if so it should have been threaded onto the flue pipe first! If they are Allan Heads then its possible they are tapped into the roof. I just had a look at a needle gun with chisel attachments too. It seemed reasonable at £30. But then if having to get hold of a compressor too things could really start to add up. I already have an angle grinder but not used if before. Not sure of all it can do and the attachments. If i used the wire brush attachment could i also clean the rust off the stove with that. And could i clean and repaint stove without taking it apart. Or is it advisable to paint parts separately then reassemble. I do have a fair few other jobs to do. Taking back paint and rust for when repacing windows and eventually the paint job on whole thing. So i dont mind investing in the right tools. I also saw a scraper tool on a video i saw. Could the needle gun be used when it comes to blacking too? Ref your rusty stove, cheapest easy option is to black lead it, apply with a rag then polish it off, a bit like cleaning shoes. Stoves come up a treat. Angle grinders are lovely, flexible, powerful tools, but you can easily damage yourself and your boat, can you get somebody to give you a bit of help and instruction? A course sanding disc (with an angle grinder sanding attachment) is a good way to start. These will remove paint and most rust but do leave marks on the metal surface, which is why I said best not for use on a smart boat. Probably ok for roof and hull and but not for cabin sides. A hand help wire brush will probably do the stove, no need for a full stove strip down. 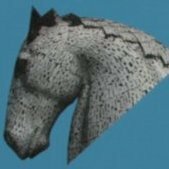 I would then paint it using brush on high temperature paint. This lasts much longer than stove blacking. Doing a stove in Stove black is satisfying but it does not last long, its one for the traditionalists,like polishing brass. Needle guns are good for sorting significant rust, they are just one step down from shot blasting. Doing a complete boat with a needle gun would be very tedious. A few boatyards will have a compressor and might even lend you a needle gun, but its not usual to needle gun prior to blacking. I suggest you only need a needle gun if you plan to do a lot of major steelwork jobs, most boat welders probably don't have one. If using a brush attachment on a small (5" or less) angle grinder, make sure the speed is reduced. (If it's one with a fixed speed, then don't use a wire brush!) Failure to observe this results in death of the angle grinder. Also, don't rely on the locking pin when removing the brush, whatever size of grinder you're using. If﻿ using a brush attachment on a small (5" or less) angle grinde﻿r, make ﻿sure the speed is reduced. (If it's one with a fixed s﻿﻿﻿pee﻿d, then don't use a wire brush!) Failure to observe this results in death of the angle grinder. I’m curious about this. I have a couple of 4” (or are they 3 1/2”?) angle grinders and one of them has had a wire brush attached all its life. Currently it’s about 8 years old and still going strong (if a little noisier). It was dead cheap too, about a tenner if memory serves correctly. A long long time ago when I was doing model engineering up in the loft building steam loco's I was burning the midnight oil one night over a problem. I was in the process of renewing the flooring and was just standing on an old board working at my lathe. I was tired and started up the lathe with a big chuck key still in the chuck. It flew out missed me and Craaassshhh!! it went clean through the lath and plaster ceiling and landed next to dad in bed, it didn't even wake him. I had to mend the ceiling though. Most certainly ear defenders. If you skip the eye protection then you will loose an eye if you are very unlucky, but if you skip the ear defenders then you WILL loose some hearing. We are all born with a finite amount of hearing and it wears out. Wish I had been more careful when I was younger. Its worth pointing out that when its all sorted out the collar should bolt to the roof on some sort of sealant. The flue pipe should then pass clean through the collar without touching it at all, with the resulting gap filled with stove rope, and optionally some high temperature flexible sealant. I like the idea of the high temperature paint. Then i can get funky. Great idea. I can see theres already harsh marks from the angle grinder from previous owners attempt at taking back paint and redoing. I have gauntlets and eye protection. Good advice on the earplugs too. The sanding attachment may be enough for the roof and perhaps the collar needs going over with the wire brush attachment as it looks very rusty under there. Someone to demonstrate would be good. I can ask around. But a youtube video may have to suffice. Or just the wire brush by hand. Ive got the high temp sealant at thd ready. Just got to buy some new coach bolts, find those nuts on the inside to get the thing undone. Then hope theres no unexpected things lurking. Got a dry day free on weds. Thdn thurs and fri looks dry. Sat rain. Enough time to cure? I can stay away a few nights while it all sets.